SoundStage! Australia has had the pleasure of attending many of the monthly events throughout the years and we’ve found the quality of the presentations, the members’ music selections and the organisational and social aspects of the meetings to be outstanding. For the March 10 2019 meeting, I was invited to present a club first. For quite some time, SAC President Tom Waters was aware of some members who were searching for clarification of the terms that reviewers use to describe sonic qualities. While some of the terms such as bass depth or dynamic contrast may be self-explanatory, other descriptors have somewhat differing meanings to different listeners. My aim for the presentation was to explain, in a lively informal way, some of the terms we reviewers use to describe what we hear when we review a given product. The best way to go about this was for me to compile a set of the most commonly-used descriptors, then in my own words describe their meaning and, finally, to support the words with illustrations via a selection of astutely relevant music. Among the 45 or so members at the meeting was guest David Gibbins of the Hunter Audio Enthusiasts (HAE) group, from northern inland New South Wales, who fortuitously was attending a concert in Sydney on that weekend. Without notes, I’m told, David was able to produce a superb report. It makes for great reading and captures the events of the day with fluid accuracy. David has given SoundStage! Australia permission to publish it in part below. I found Edgar's presentation revealed someone who loved music, with a systematic and rigorous approach, honestly reporting what he heard and felt. Edgar's humour popped out too. For example when he said (truly) he likes chocolate, some of us like strawberry, some prefer vanilla, some mango ... but ... we ALL like ice-cream! A great analogy I thought. All of us like music, and all of us like it reproduced at the high end, but all of us have different tastes – so before you commit to something a reviewer writes, listen to it yourself and make up your own mind! Avery Fisher, a pioneer audio developer, music lover and philanthropist to music and musicians – https://en.wikipedia.org/wiki/Avery_Fisher – once said to never linger when listening to evaluate sound quality, just listen quickly and go with your first impression. When I walked in before the meeting, a drum recording was playing... and my instant impression was 'fantastic'! How refreshing for a professional reviewer to be right up-front saying that (like all of us!) he has "biases". Perhaps Edgar was being more humble than accurate because he then structured his presentation on what I thought were a logical set of review criteria rather than 'biases'. Edgar's prime evaluation targets are Tone/Timbre, dynamics and detail. These and other evaluation markers for Edgar are described below via his demonstrations. Tone/Timbre. CD: Duet by Sylvain Luc, Biréli Lagrène. Track 9 "Stompin' At The Savoy". As a guitarist, Edgar said he finds this a great reference for timbre. The piece includes some guitar body tapping ("thumping"). Dynamics. CD: Dave Brubeck's drummer Joe Morello’s Morello Standard Time. Track “Take Five”. CD: Jackson Browne The Naked Ride Home. Track “Sergio Leone”. Scale. CD: Movie Soundtrack Sampler. Track "On Earth as it is in Heaven" from the movie The Mission. Clarity/Presence. CD: Ten Songs from Live at Carnegie Hall by Ryan Adams. Track “Give me Something Good”. Comment by David: Definitely "present", but also distractingly reverberant and scratchy in my opinion. Stage width and depth. CD: Belafonte at Carnegie Hall, Harry Belafonte. Track “Jamaica Farewell”. CD: Living in Clip, Ani Di Franco. Track “Amazing Grace”. Bass Depth. Poems of Thunder, Yim Hok-Man. Track “Poem of Chinese Drum”. Bass Punch. CD: Rage Against the Machine. Track “Take the Power Back”. Image focus and placement. CD: Tangents Gary Peacock Trio. Track "December Wings". The absolute standouts for me were: Dave Brubeck's drummer Joe Morello’s “Take Five”; "On Earth as it is in Heaven"; Belafonte at Carnegie Hall and the Yim Hok-Man Chinese Drums. Curiously for me, the reproduced sound had a significantly different timbre to the natural spoken human voices with a tilt for higher frequencies and more clarity. Speculation: Maybe this could be due to the speakers being more forward facing (directional) than the human voice. Maybe if dipolar speakers were used this would be less pronounced? Edgar invited questions and got a lot! He was able to confirm a complete independence in his review process and confirmed this is the case for all 'high end" reviewers known to him. He said that his set up is definitely 'high end' (eg. speakers about $100,000) in a great listening environment as it happens (a room the right proportions with a vertical slot to a higher level giving bass control). He indicated his trepidation now he is in the process of moving houses. David finishes his report with further secondary insights and mentions of SoundStage! Australia. Thank you David. I certainly enjoyed myself at the meeting and found the audience to be engaged, inquisitive and, from my impressions (fortunately), entertained. I, once again, thank Tom Waters SAC President and Steven Polley Events Coordinator, for the invitation and the excellent equipment supplied on the day which facilitated accurate and illustrative demonstrations. The gear was based around core products such as Gryphon Mikado Signature, Classé Audio CP-800 preamplifier, Plinius Reference Class-A amplifier, IsoTek Sigma power conditioner and ZenSati cables. The superb Hulgich Audio Ella Mk. 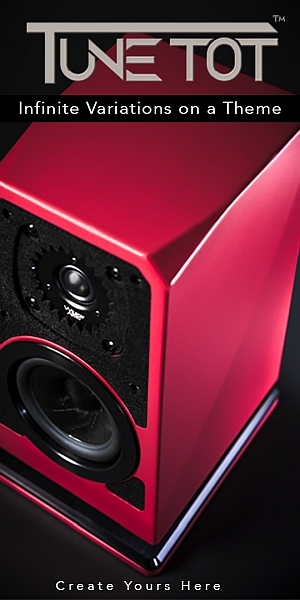 II speakers performed extremely well in the context of this system and rather difficult room. I would also like to thank David Gibbins for his thoroughly comprehensive report and for his permission to publish here. I look forward to another day of music and ‘Reviewer’ terminology demonstrations at some stage in the not too distant future. I’ll finish with a deeply insightful quote from President Tom Waters which encapsulates not just the club mission but also the entire philosophy behind this wonderful industry of ours.